I love the cute little mini set featured today! You could use the clock for all sorts of things, and the sentiments are pretty versatile too. I love it when you can do lots of things with one set! For my card, I used the adorable image and two of the sentiments, both of which were stamped in Tuxedo Black Memento ink, onto green cardstock. I edged the cardstock with Tea Green Chalking Ink from Quick Quotes and used some of their polka dot paper to back it as well. And of course, the card needed purple so everything's mounted on a pretty purple card base! What a FUN belated birthday card! Love this image. The chalk inked edges is a nice added touch. Very cute. I like the polka dot background. Fun card with the polka dot paper -- love the purple base! Cute card!!! Love the color choice. Very, very cute card - and I like the colors you selected! Love this stamp set and this is such a cute card! Love the polka dot background very cute! 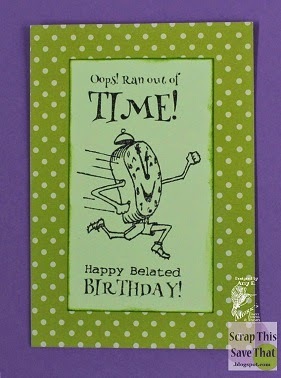 Love this card, it's a great way to send a card when you know you are late. The image and sentiment on this card are so cute and this is a must-have stamp set! Love the dotted paper and this cute image! Fun background paper and an adorable image! Love this set!